You could pull apart the Death Star, run some diagnostics and upgrades, and get that thing flying right. With a lot of coffee. That's what your system administrator resume needs to prove. You're up against 300 other sysadmins, all vying for the job. So, how can you stand out and get the interview? A system administrator resume example better than 9 out of 10 other resumes. How to write a system administrator resume that lands more interviews. Tips and examples of how to put skills and achievements on a systems administrator resume. How to describe your experience on a resume for a system administrator to get any job you want. Here's a sample resume for a system administrator made using our resume builder. What's the Best Format for a System Administrator Resume? Picture a hiring manager named Jennie. She's got nothing but free time to read 300+ system admin resumes. She'll take her time and pick the best. Your hiring manager is Steve. He's got 4 hours to read that stack of resumes. He'll skim them all, then read the interesting ones. By starting with the chronological resume format. It's the best systems administrator resume format. It puts your newest achievements first. That's vital in an industry where yesterday's tech is as popular as floppy disks and light pens. Set it up right with the best resume fonts. Connect them with eye-catching headings and approachable white space. 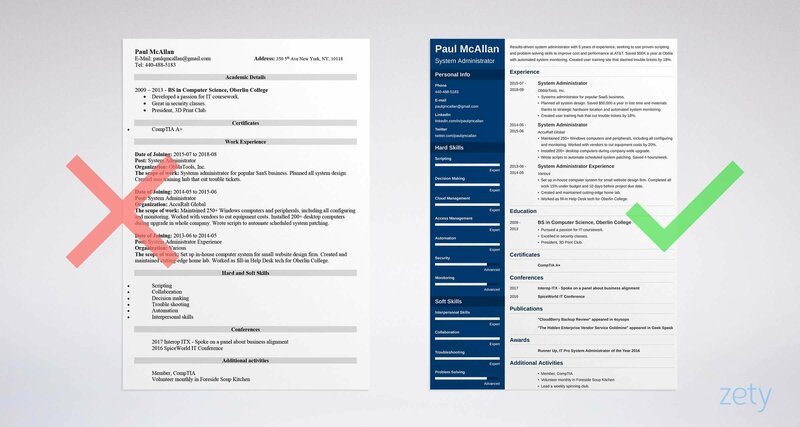 What about PDF vs Word resumes? Back before radio, Windows system admin resumes in PDF form didn't work. Applicant Tracking Software didn't like them. That's not true today, with machine-readable PDFs. So, send a system administrator resume PDF unless the job ad says not to. Pro Tip: Switching careers? Consider a system engineer resume in the combination resume format. It'll let you show sys admin skills you used in non-admin jobs. System Administrator Resume Summary or Resume Objective? Remember our IT manager, Steve? He's at his wraparound desk, trying to hire for that unicorn job. What's to stop him from skimming your great system administrator resume and moving on? A resume summary or resume objective, that's what. It's the glue that sticks him to your skills. A resume summary works for old hands. Use it if you've got terabytes of experience. A resume objective is for fresh graduates. Use it if your work history has yet to be configured. Either way, pack both with relevant sysadmin achievements. Here are two systems administrator resume examples to demonstrate. Why does one of these sysadmin resume examples outperform the other? Engaged system administrator looking for new job with room for advancement. Very skilled in security, cloud management, and decision making. Can start immediately. That's not a total shutdown, but it won't overflow your stack with interviews either. Results-driven system administrator with 5 years of experience, seeking to use proven scripting and problem solving skills to improve cost and performance at AT&T. Saved $50K a year at Obbla with automated system monitoring. Created user training site that slashed trouble tickets by 18%. That's a single pane of glass for your career. The IT manager will put down his shawarma to get at your contact info. But what if your experience is still in the bubble wrap? If that's you, use the entry-level system admin resume examples below. Are you writing a junior system administrator resume? They used to say to show your passion in a resume objective. That advice is deprecated. Junior system administrator looking for entry-level sysadmin job. Haven't yet worked as an admin, but will work exceptionally hard for the right position. Passion's great, but the IT manager wants to know if you can do the job. Answer "yes" with details that fit the offer like a cable to a port. Goal-oriented system administrator, seeking to increase performance and lower cost for AccuRalt Global. Have set up network system administration for small local firms. All were 15% under-budget and finished before due date. Have maintained high tech Uinux home lab for 5 years. The IT manager would have to have a dongle loose to skip your systems engineer resume. But hold up a second—how can a total novice get a system administrator resume objective like that? Find the answer in the next section, on experience. Pro Tip: A system administrator professional summary should be short. Three sentences is plenty. Show the manager a glimpse of your experience and achievements. One thing, and one thing only, will convince the hiring manager to interview you. It's how you show resume experience on a Windows system admin resume. Your IT administrator resume experience must tie you to the job like a front panel connector. Start with your most recent job. Then plug in 3-5 bullet points. But not just any bullet points. Make sure they show achievements compatible with the job ad. If you're writing an AWS resume, cram it with AWS resume points. Here are two systems administrator resume examples to work from. Can you see why the first of these system administrator resume samples works? Systems administrator for popular SaaS business. Planned all system design. Saved $50,000 a year in lost time and materials thanks to strategic hardware location and automated system monitoring. Created user training hub that cut trouble tickets by 18%. That'll make the IT manager drop his copy of Start with Why. It's got metrics and measures that match the job ad. Systems administrator in SaaS firm. Planned all system design, including hardware location and monitoring. In charge of handling all trouble tickets. That's like writing "I can do computers" on your resume for servers. Really? Which computers? What successes have you had? Sadly, some of us don't have experience to list. Are you more like Peter Parker, not yet bitten by the spider? Feast your optic inputs on the next two system administrator resume examples. Can fixing a friend's computer get you into the best system administrator jobs? It takes at least six months of full time enterprise work to be a skilled sysadmin. But entry-level system administrator jobs are different. So, let's say you waited tables. Meanwhile, you helped maintain the restaurant's computer system. Definitely put that on your entry-level systems admin resume. See that in operation in the entry-level system admin resume examples below. System Administrator Experience: Still looking for first sysadmin job. Set up in-house computer system for small web design firm. Completed work 15% under budget and 10 days before due date. Created and maintained cutting-edge home lab, fully automated via PowerShell. Worked as fill-in Help Desk tech for Oberlin College. In waitstaff job, installed and maintained Windows 10 System with order station. That's worthy of Evi Nemeth. But you probably already have the chops to write a system Windows system admin resume like that. Pro Tip: Need more experience for an entry-level system administrator resume? Not sure where to start? Check out this great rookie system admin bootcamp post on Reddit. We all know experience beats education in a shell-scripting resume or AWS administrator resume. But you have to show education. So use it right. It's like repurposing unneeded CPU time to mine Bitcoin or help SETI. Here are two system administration resume examples as a guide. These sample system administrator resume sections target the same job. It needs someone who knows Security and 3D Printing.. Pursued a passion for IT coursework. Blammo. Like a glove. That's basically Thomas Limoncelli, back in school. Wow, CompTIA F+. You must have played a lot of Beer Pong. But add details, and you've turned your Unix resume off and on again. Pro Tip: Education matters most on entry-level system administrator resumes. If you're new, spend more time on educational achievements. Journey with me into the IT manager's mind. He cares about one thing: "Have you got the skills?" "Yes," you answer on your systems administrator resume. "I've got lots of skills. In fact, here's a list of every IT skill there is." You must prioritize the skills shown in the job ad. Let's see the difference in two IT administrator resume examples. They both try for a job that wants skills in Windows installation, configuration, monitoring, automation and script writing. Yuck. Who brought the malware? Maintained 250+ Windows computers, including configuring and monitoring. Worked with vendors to cut equipment costs 20%. Installed 200+ desktop computers during company-wide upgrade. Wrote scripts to automate scheduled system patching. Saved 4 hours/week. That's not just a systems administrator resume skills list. It fills the manager's trouble ticket. The table below is chock-a-block with system administrator keywords on a resume. You can add to this system administrator skills list from job descriptions online. Do the above, and your resume for a system administrator will look like Tom Carpenter's. What's the best certification for a system administrator resume? CCNA? CompTIA A+? RHCE? MCSE? It all depends what job you're going for. Basically, a cert will help you stand out from other entry-level system administrator resumes. So, show it prominently. Put it in your Linux resume summary, and in a special certifications section. Pro Tip: If your system resume is thin, you can list certification exam scores, if they're high. Anything that will impress the IT manager is fair game. How will the IT manager pick the best applicant? He'll start with the 100 or so resumes with the right skills and experience. But then he'll need a tiebreaker. That comes down to personality. How can you show that in a systems administrator resume? With special "other" sections that tell your story like the title crawl at the beginning of Star Wars. See these Windows system admin resume examples for details. Hey, everybody needs a hobby. But those don't explain why you're the perfect sysadmin. That's Æleen Frisch league. You're obviously not just in it because you need money to buy cheese curls. But it only takes a little reflection to build a system administrator resume like that. Pro Tip: Awards, conferences, publications, and even management commendations make great systems administrator resume material. How About a Cover Letter for a System Administrator? Do you really need a cover letter for system administration? To do it right, start your cover letter for system engineers with the manager's name. Then, show you understand the need. Close your cover letter with an offer. Try, "I'd relish the chance to show how I designed a user training portal that slashed trouble tickets by almost 20%." Pro Tip: A system administrator cover letter shouldn't be a carbon copy of your AWS experience resume. Stick to one or two achievements and talk mostly about the company and job. What contact info should you add to a resume for system admins? What should you leave off? But ditch the snail mail address. Add the company's city if you like. Then, include social media profile links like LinkedIn or ServerFault. Both can give the hiring manager a better picture of your admin powers. Pro Tip: Don't let your strong opinions about string cheese scuttle a perfect system administrator resume. Make your Facebook posts visible only to your friends. Tie your system admin resume to the job as if with 40,000 zip ties. Use bullet points that match the job description. Find skills and qualities in the job ad. Then find times in your work history when you've nailed those things. Voila, instant interview. Finally, use dedicated "other" sections to show you live and breathe sysadmin work. That can mean continuing ed, volunteer work, or just an "attaboy" from management. Do you have questions on how to write a great resume for a system administrator? Not sure how to describe your skills or achievements? Give us a shout in the comments! We're glad to help!